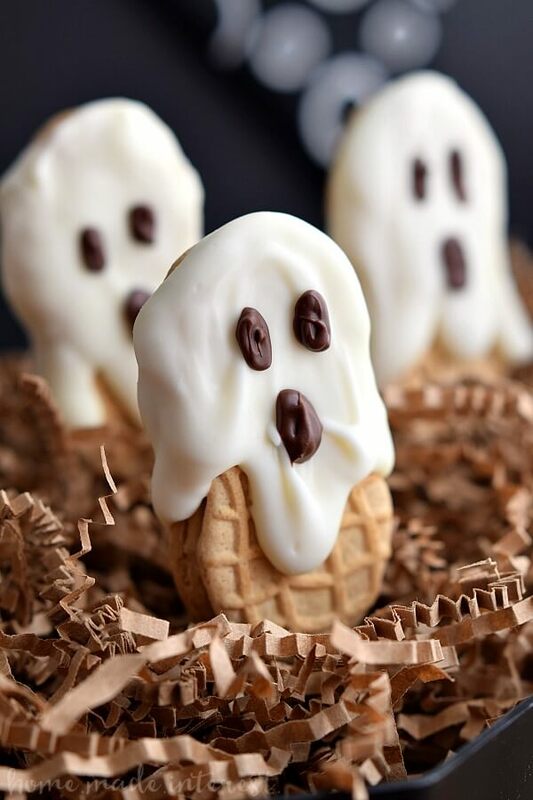 Halloween is all about showing your creativity, be it in terms of decoration, costume and even food. 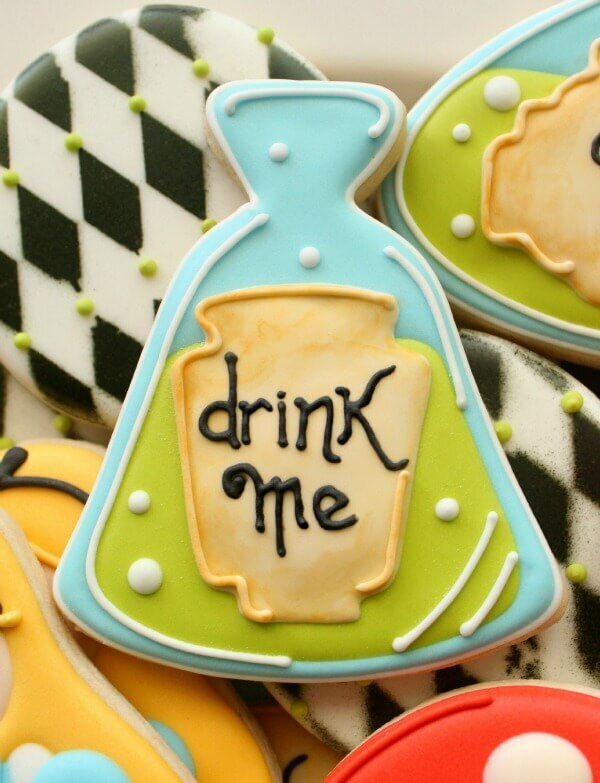 And nothing screams creativity more than delectable and beautifully stylized cookies. 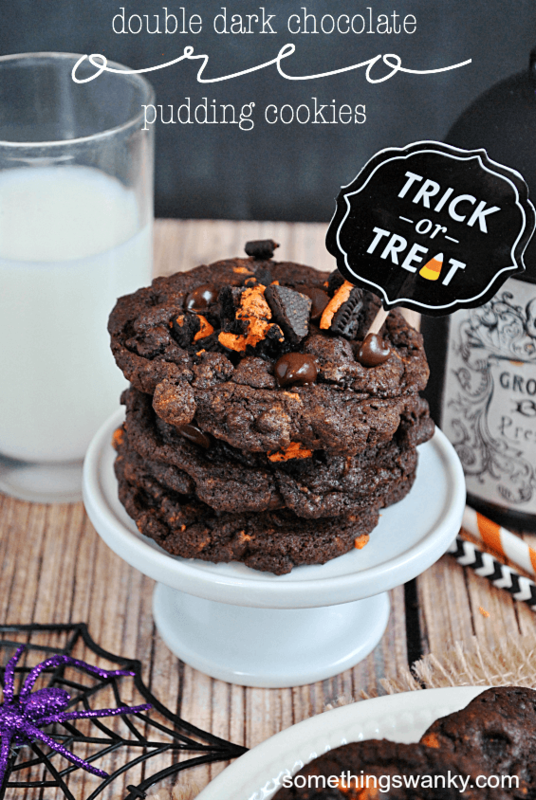 So if you’re looking for some creepy, gooey, spooky, but delicious Halloween cookie recipes, you’ve come at the right place. 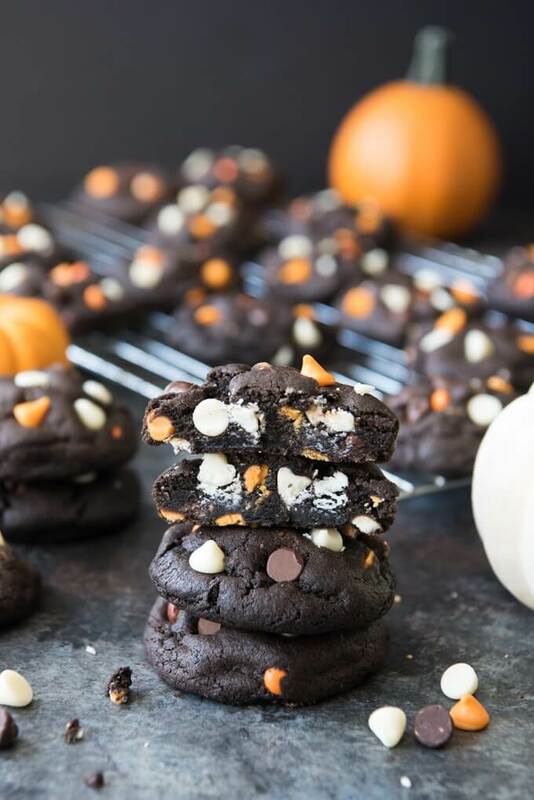 We’ve listed 30 of the best Halloween cookie recipes below. Take a look! 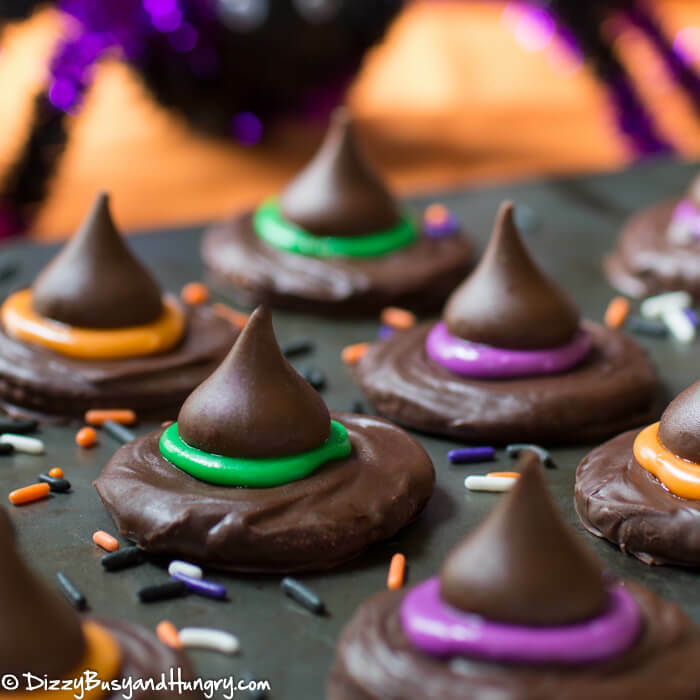 You’ll need an assortment of baking chips in Halloween colors to make these simple, but classic chocolate cookies stand out. Would you believe that these cookies are no bake? Isn’t it astonishing? And the best part is that they amazing. You can either present them as a school snack, where children can share with friends. 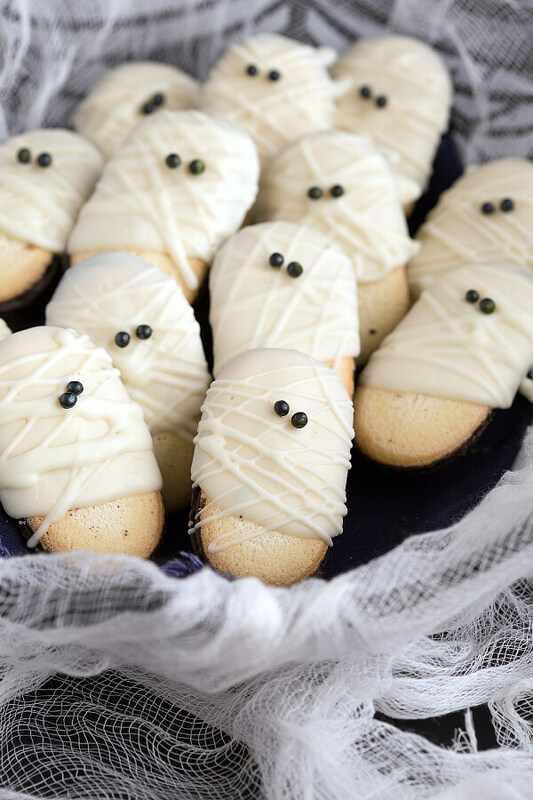 You don’t have to wait for 70 days to make these mummies. Just 10 minutes and a batch of delicious, triple chocolate cookies will be on the table. Don’t they look fancy? Creativity is at its height in this cookie recipe. 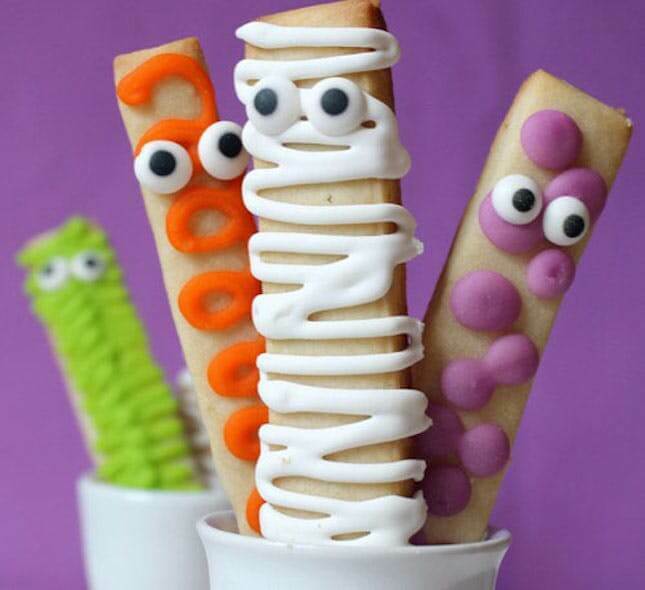 You just have to make regular cookies in the shape of sticks and decorate them in fun ways. You have to agree with me. 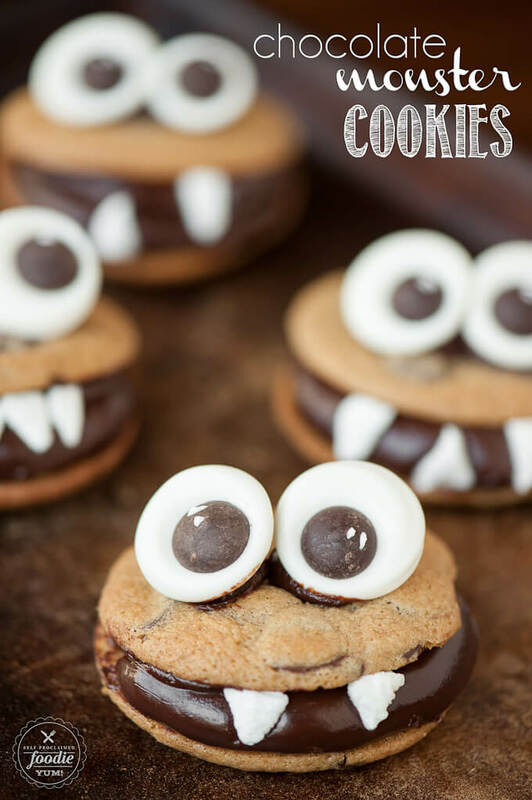 These cookies are absolutely adorable and loaded with different textures and flavors. They’ll first enjoy the gummy worm and then devour the creamy cookies. 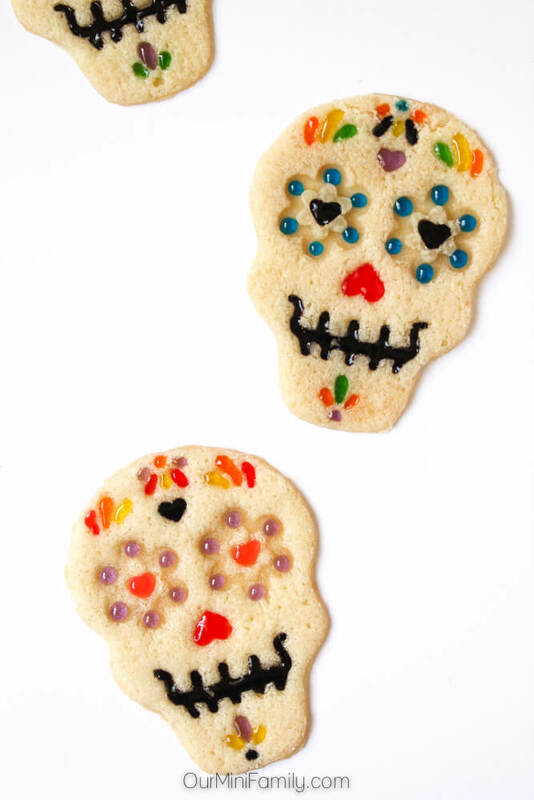 These sugar skull cookies definitely stand out amongst the other cookies listed here. The design is intricate, yet not difficult to achieve. Just select the right color combination. 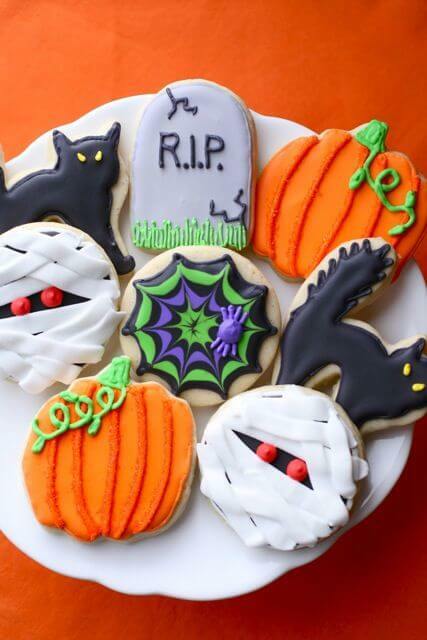 We’ve included a Halloween cookie recipe for your gluten intolerant friends as well. Why should they be left out? 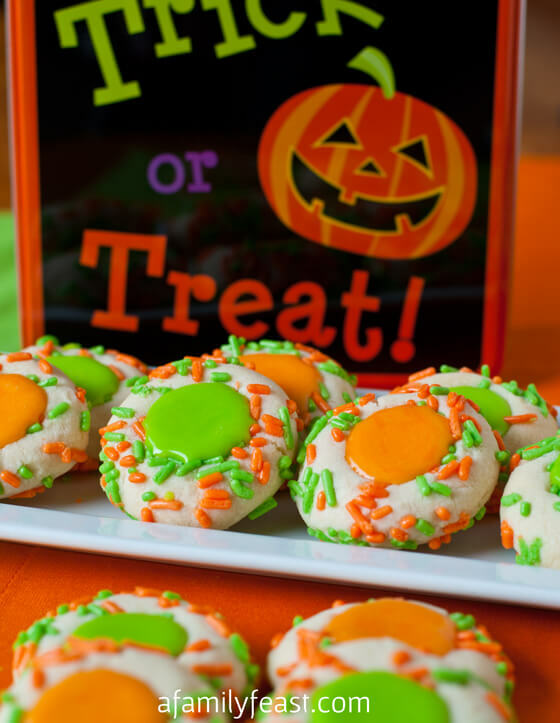 Thumbprint cookies are a classic, but the orange and green icing is making it perfect for Halloween. These are basically gingerbread cookies decorated with royal icing. Beautiful, isn’t it? This dark chocolate cooked is filled with salted caramel and is topped with sea salt for variation in flavor. The result is delicious and mouth watering black and orange treat. 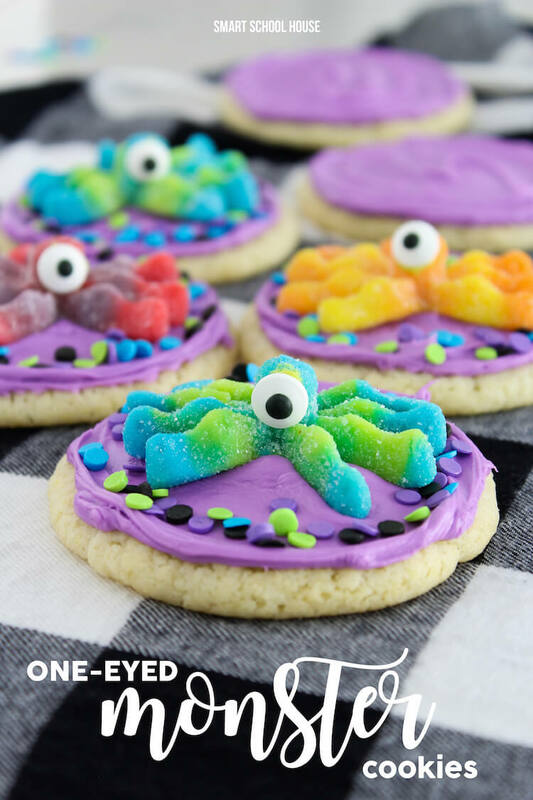 These are the most unique spider cookies in our opinion. And they’re incredibly easy to make too, if you compare to the other cookies here. 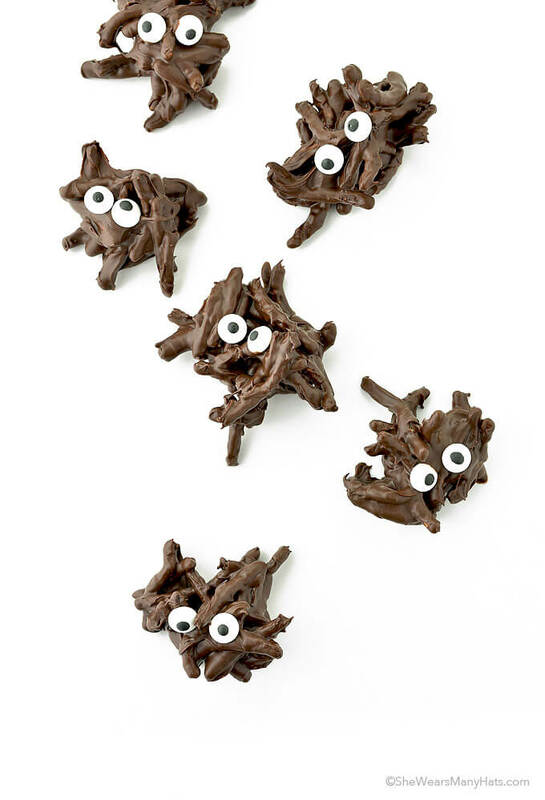 You just need chowmein noodles, candy eyes and semi-sweet chocolate to make a batch of these cuties. These cookies are best made and enjoyed by children. They just have to decorate candy bought pretzels and turn them into the fearful monster. A perfect example of tiny, but mighty. They are so delicious that you will end up eating 10s of them and won’t even realize. A little bit of gory is allowed, even with kids, right. 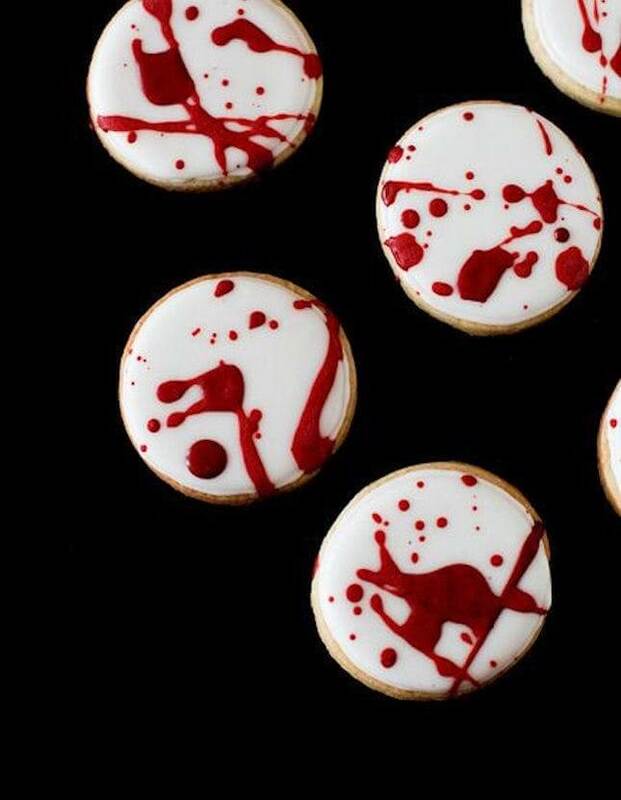 So here are some blood splattered cookies for you to follow. 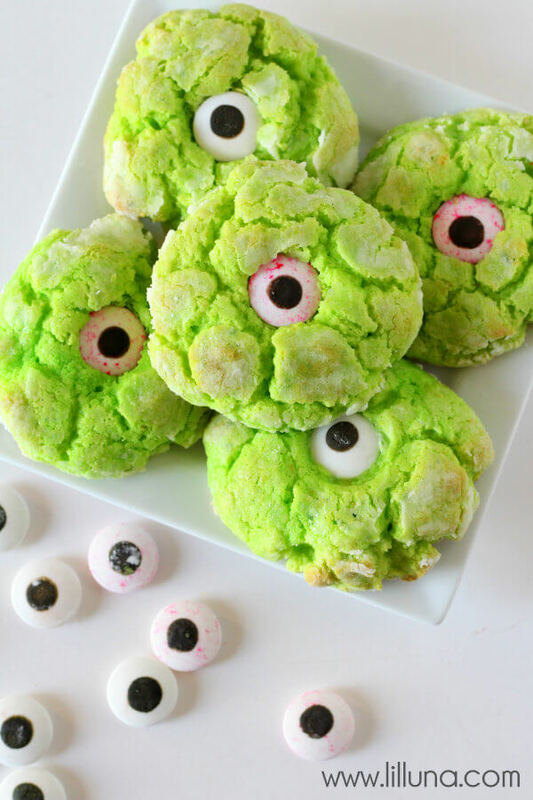 These cookies look a bit extra spooky because they’re made with yellow cake mix and then dyed green. And the googly eye is an icing on the cake. We’re sure it will take exemplary too! Unique, beautiful and incredible, words fail to describe the magnificence of this cookie. 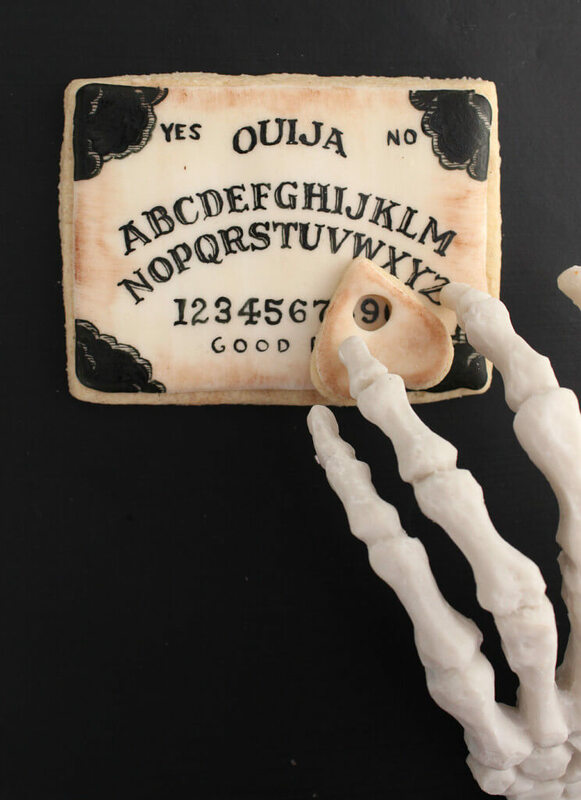 Anyone can mistake it for the real Ouija board. 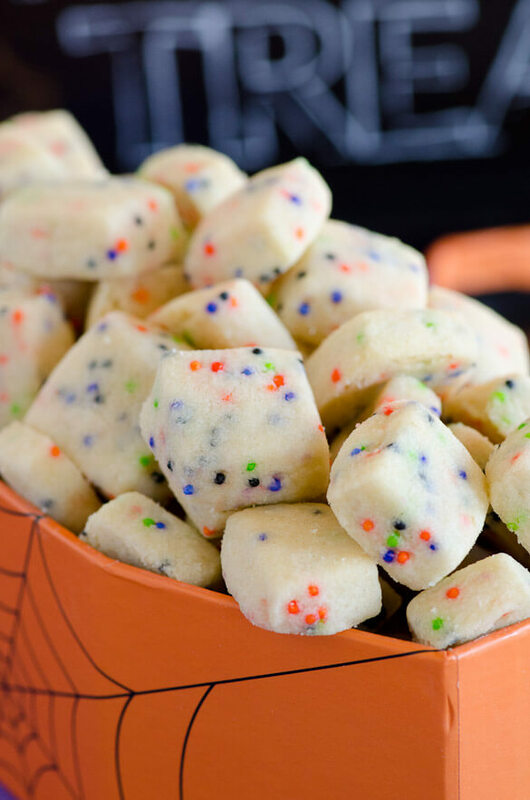 Technically, these are not cookies, but macarons, but how does it even matter in a festival as fun as Halloween. 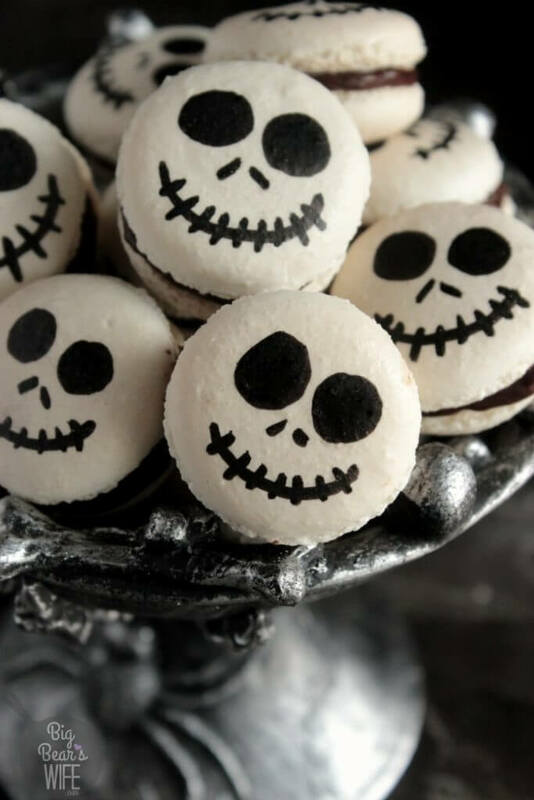 At least, these macarons look like Jack Skellington. While the taste is sure to be amazing, the decoration part would be even more fun. Let your child make these cookies, or at least do the decoration. Mirror mirror on the wall, which is the scariest looking cookie of them all? 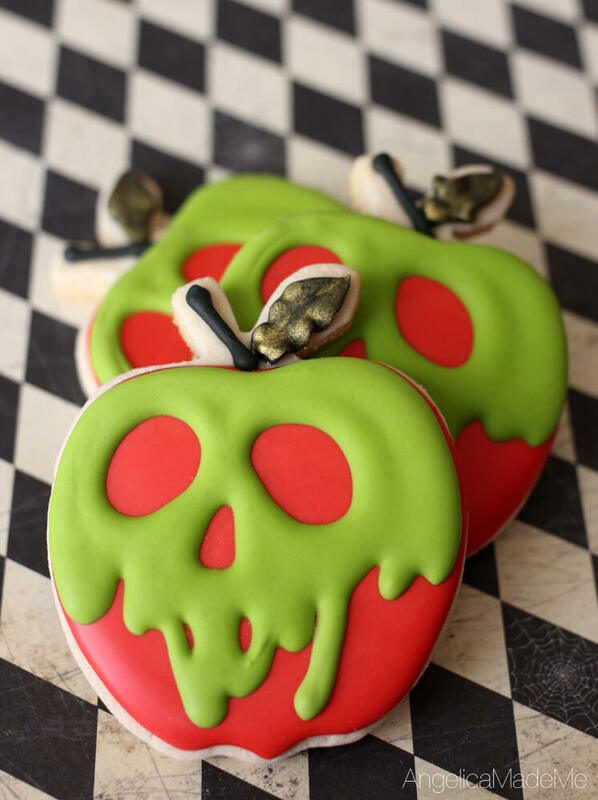 Definitely this apple shaped cookie laced with poison. 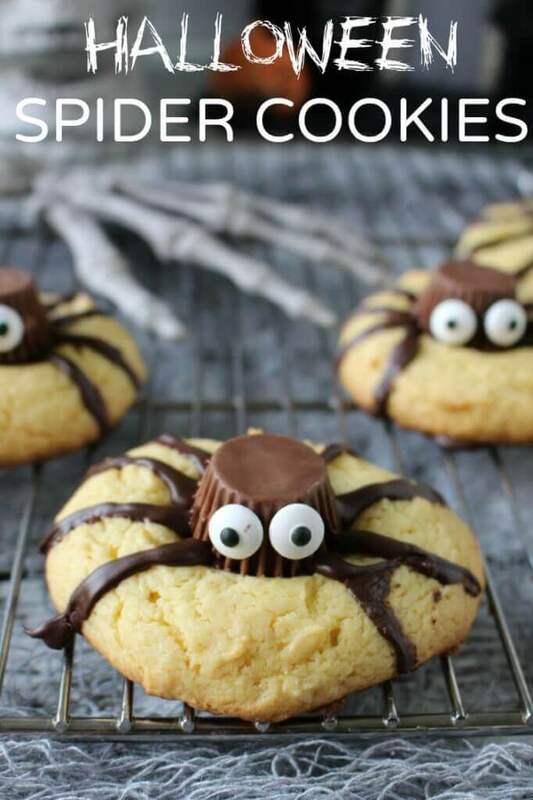 Now that’s one realistic looking spider cookie. 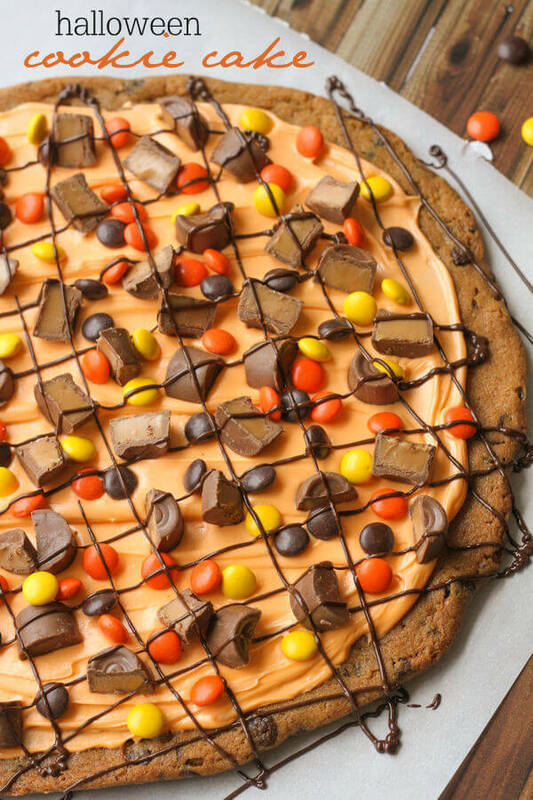 An excellent use of Reese’s cup, we must say. And keep the cookie plain to get a burst of chocolate and peanut butter flavor. You just need three ingredients to make these cookies. And the best part is that it doesn’t need baking. But don’t you think it’s too cute to be eaten? Another unique design and once again, we’re swept off our feet. 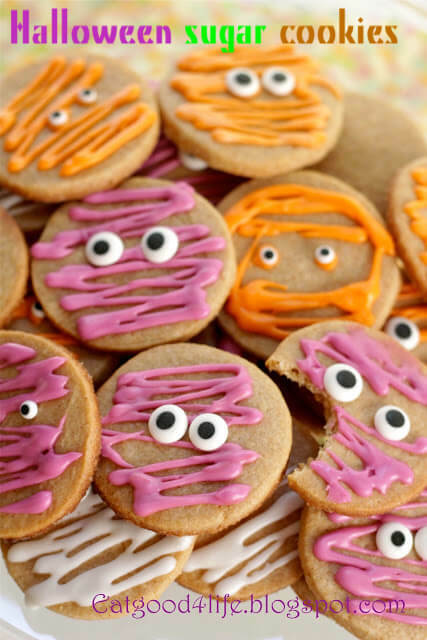 These cookies will set a right mood for Halloween dinner. 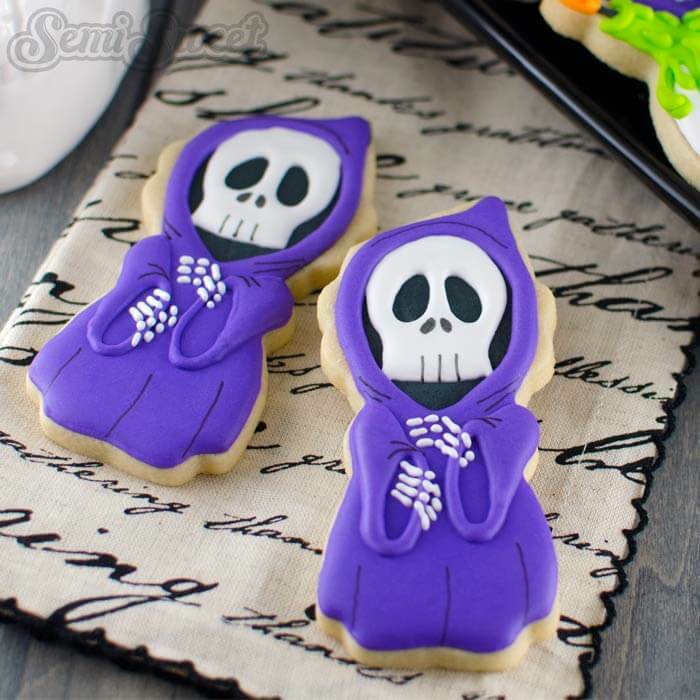 If you want to show the world how amazing your cookie skills are, make these grim reaper cookies. Isn’t it beautiful? A cookie which isn’t a cookie, but a cake. So you get the best of both here. And honestly speaking, they look like pizza to us, too. However it may look, we’re sure it will taste amazing. We must say the detailing of these cookies is amazing. And they do look a bit complicated to achieve, but they’re actually very easy. 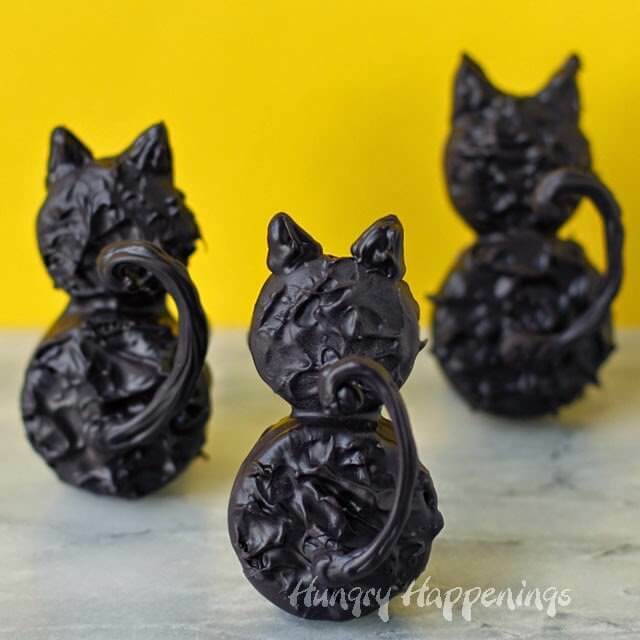 You just need food dye, cookie cutters and royal icing. Look how colorful these cookies look? And the detailing and decoration is also Halloween friendly. You just need to ensure that the frosting is made properly. 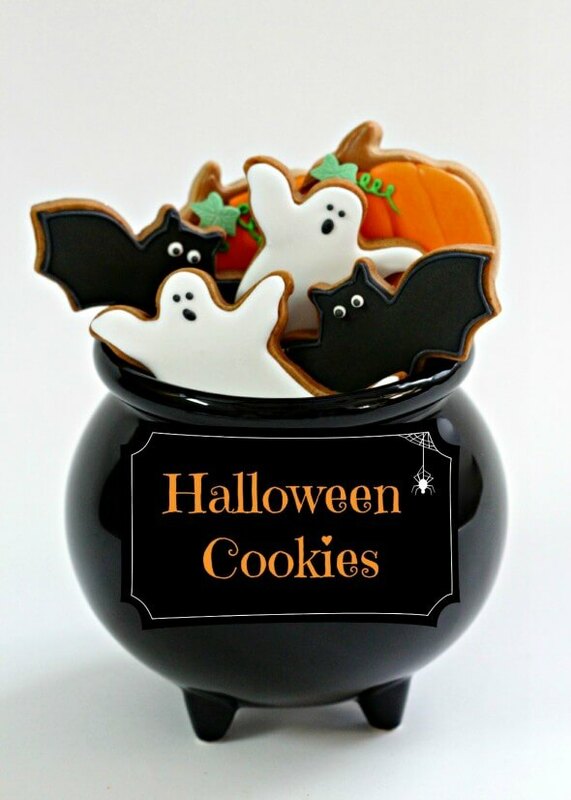 Here’s an assortment of cookies just perfect for Halloween. It features all the symbols of Halloween, which we love. 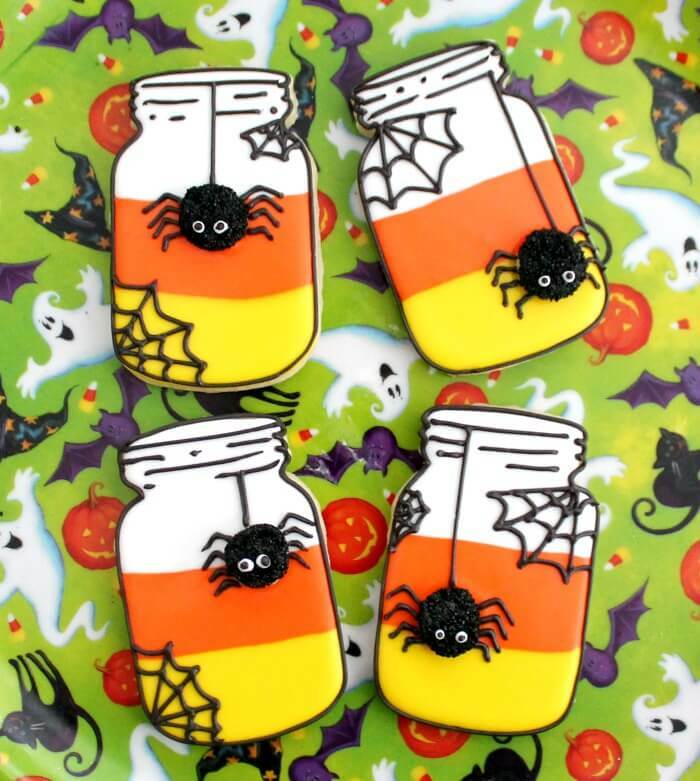 Take your Halloween dessert table to an entirely new level by making these thoroughly detailed and decadent mason jar cookies. Don’t you think these cookies are looking a lot like cartoon cookies? The black cats you see here actually Oreos and Nilla Wafers in disguise. Hard to believe, right? 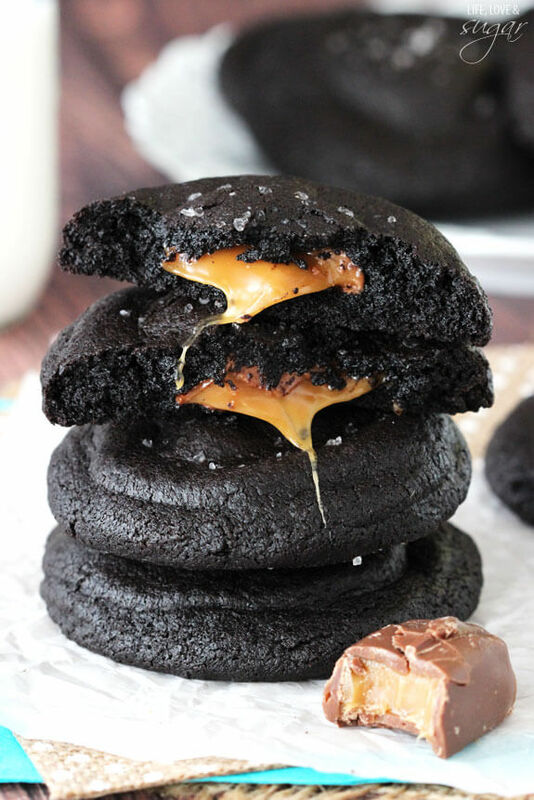 This cookie, with chocolate is literally oozing out is looking insanely delicious. It’s fudgy, soft, and filled with flavor. After all, anything with chocolate has to taste nice. 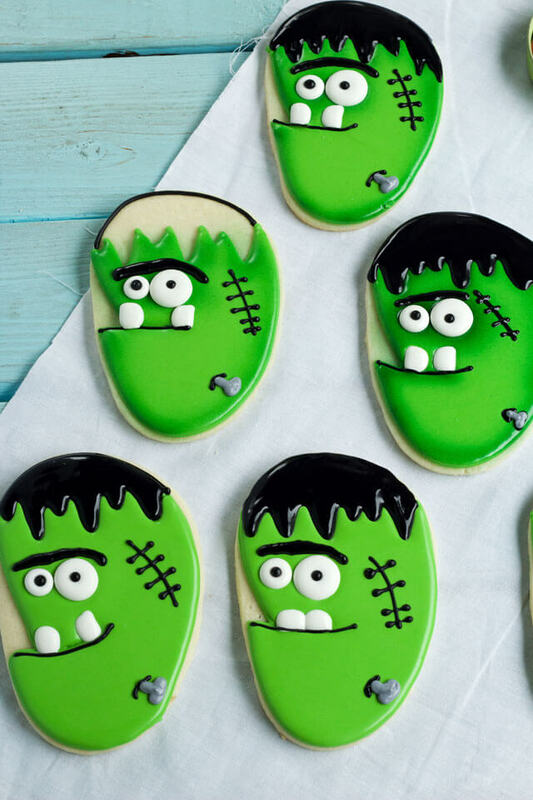 We’re confident the little ghouls in your house will love these cookies. 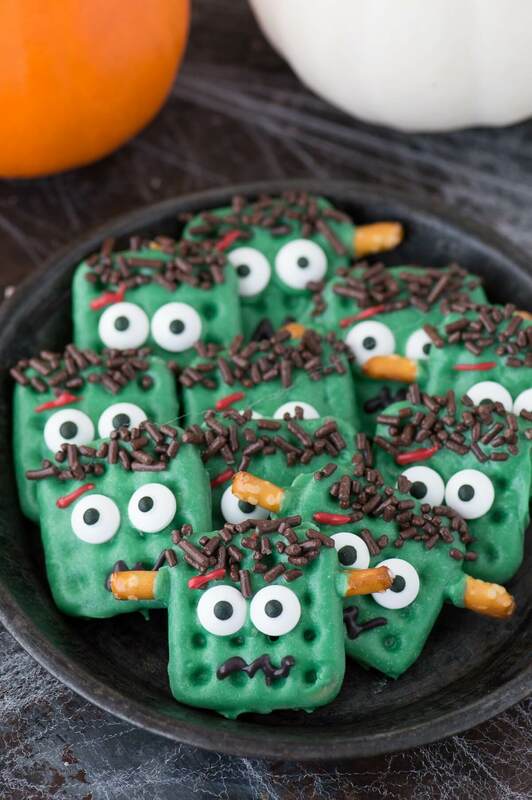 You can even take their help in making these Halloween cookies. We’re sure they won’t refuse to help you. 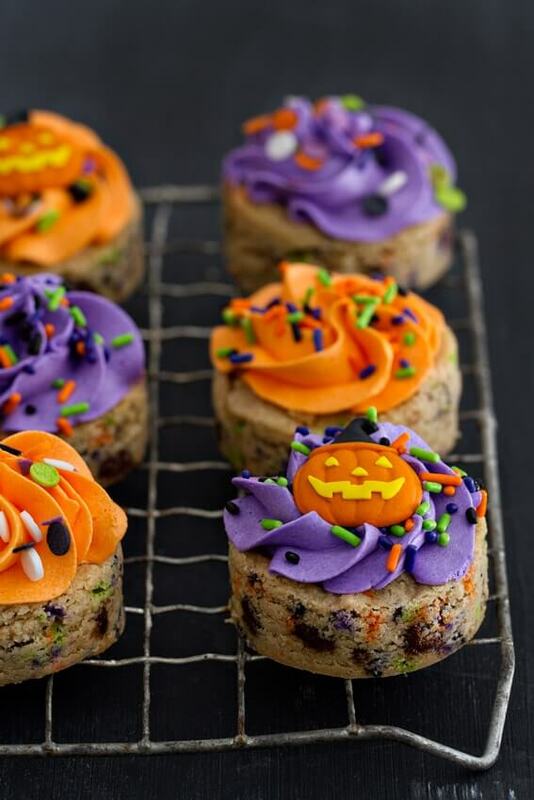 You can prepare these Halloween cookie recipes to gift the little trick and treaters as well.